But the real kicker is the percentages in the “behind their peer group” category. A simple filtering of the VanVCD data shows they are significantly higher in the vaccinated group. More than one-quarter (25.2%) of vaccinated children perform worse than their peers developmentally, compared to just 5.5% among unvaccinated children ? a 19.7% variance! In the vaccinated category, a shocking 43.1% of parents responded with “yes” to this same question ? a sixfold increase compared to parents of unvaccinated children. In other words, vaccinated children are six times more likely than unvaccinated children to develop a chronic disease. In some cases it could be a neurological problem, and either could follow them the rest of their lives. A few thousand people have already contributed to the VanVCD database thus far. Many more thousands are needed to help either challenge or reinforce the existing findings. Again, the purpose of this survey isn’t to push any specific agenda. The intention is to conduct honest inquiry into the safety and effectiveness of vaccines ? research that, up until this point, has never been conducted. 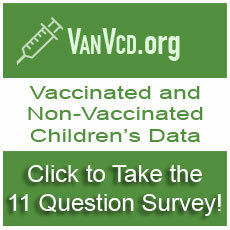 Imagine how invaluable the VanVCD database will be once millions of parents have taken the simple 11-question survey. I strongly encourage you to check out the VanVCD website, take the survey. Don’t stop there ? pass it on to all of your friends and family members for them to take. This survey needs to go viral, and you can help make it happen by spreading the word within your circles of influence.